What’s Going on with 14 Clicks? 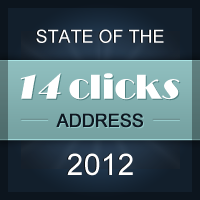 I’ve been reimagining my vision for 14 Clicks. I want to make sure that I create a resource that helps people do incredible things through entrepreneurship. Not just read, learn, and think about it. I’ve heard from a few of you about the projects that 14 Clicks has inspired you to start, but I think we can do better. And this starts with crafting a clear, long-term vision. Even though it’s been six months since I’ve updated this site, it’s been growing. In that time, we’ve had over 100,000 visits, almost 200,000 minutes of activity, and traffic grew 59.5% over the previous six months. Also towards the end of last year, somebody asked me to create something for them … something that’s never been created quite like he envisioned. So Nick Scheidies and I set out to do that. We researched, we planned, we scouted, we targeted, we asked, we listened, we produced, and we delivered. What started as a lofty project for a client turned into the most thought-provoking, standard-shifting, and purpose-questioning learning experience of my life. On Wednesday, I’ll reveal many of the important lessons I learned. If you’re subscribed, look out for that email. With that, what have you been up to? I want to know because I want to help. Can’t wait for your reveal Nick. Thanks for your update. I’ve been working on networking with my peers in the travel field and providing value for each person I meet. Also, working on my travel niche sites. Just started a new site to help new travel bloggers as well. Hey Kerwin! What have you been doing specifically to work on your travel niche sites? What’s you vision for TB101? I’m re-designing one of them to setup a membership site so that I can provide different levels of service for the users. It’s a little delayed as my programmer is finishing up another project. TB101’s purpose is to help travel bloggers get started by choosing the right niche, blogging tools, etc. so they can get their message out there. Thanks, Paul. The reveal tomorrow isn’t a venture but it is a pretty darn cool project. nice to know why you’re so busy. Yeah, it’s been tough to get back over here, Daniel. Things are going really well on the client-side, which makes it even more difficult to get over here.